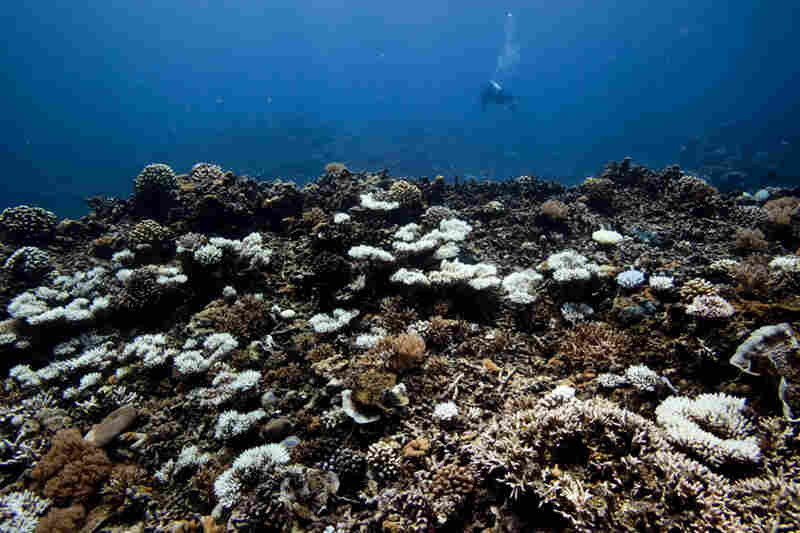 World's Coral Reefs Facing Serious Threats A major new survey of the world's coral reefs finds that they are in trouble. Overfishing and local pollution continue to grow as threats, and the reefs' long-term existence is in doubt because the world's oceans are gradually getting warmer and more acidic because of human activity. 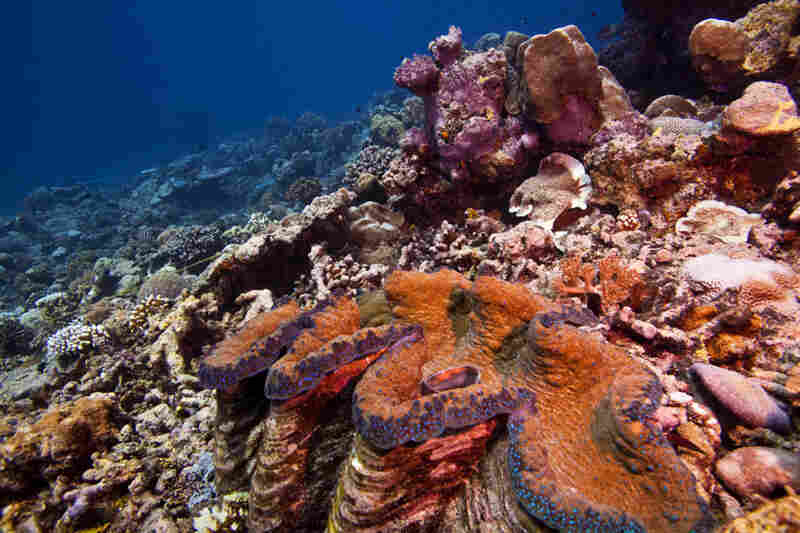 A giant clam and healthy coral reef on the east side of Palau. The coral reefs of Palau are part of a massive interconnected system that ties together Micronesia and the Western Pacific. 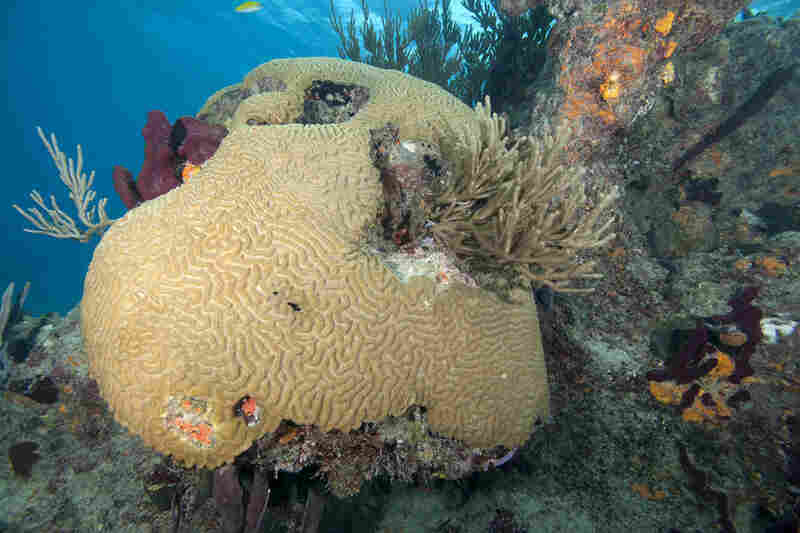 Healthy brain coral at the Exuma Cays Land and Sea Park in the Bahamas. 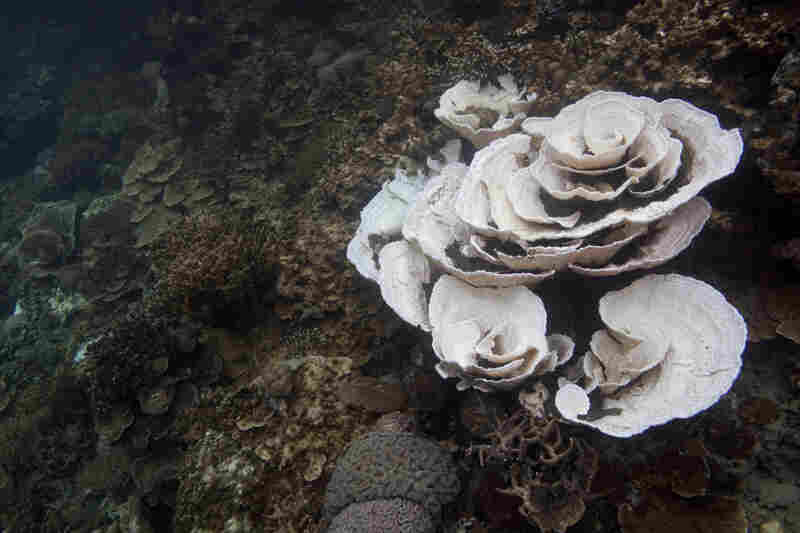 Bleached coral along the reef at the Nikko Bay monitoring site, Rock Islands, Palau. A marine researcher records data in about 35 feet of water on the east side of Palau. 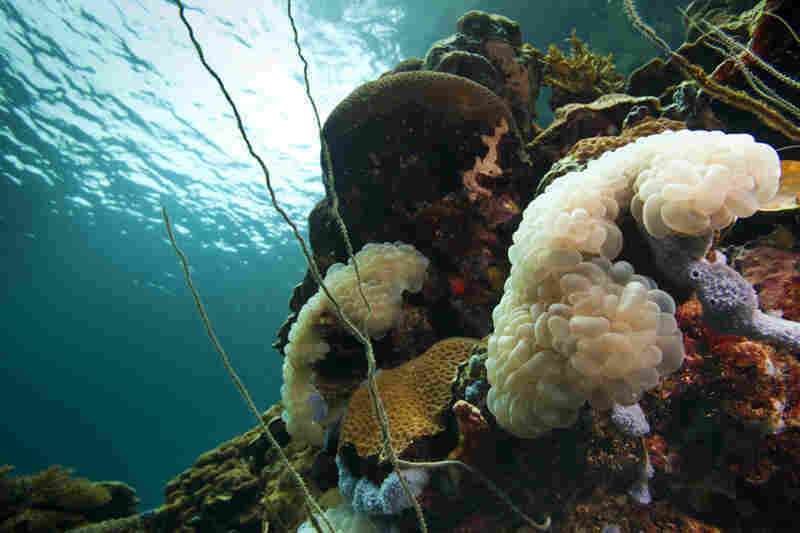 The white bleached coral are indicative of warming waters and other threats to the ecosystem. Healthy coral reef at Nikko Bay, Rock Islands, Palau. 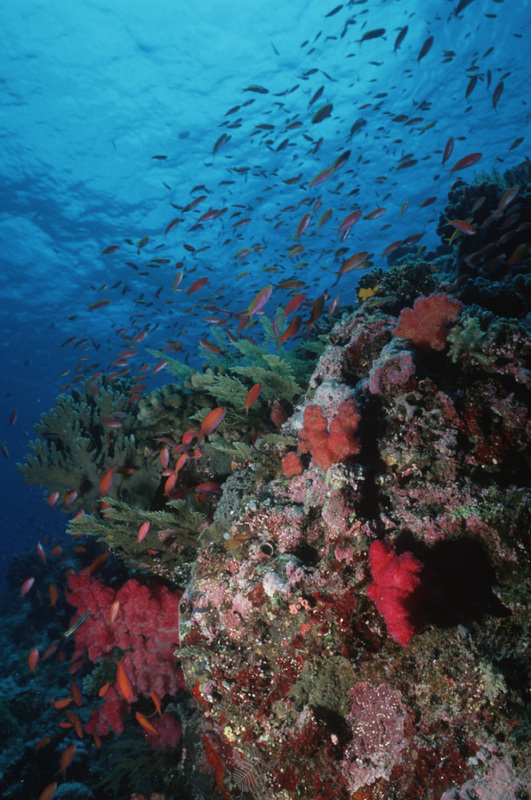 Currently we find 75 percent of the world's reefs are threatened by a combination of local and global threats. There's a lot at stake: Coral reefs are spectacular ecosystems, overflowing with diverse and colorful marine life. They're also the source of food and economic sustenance to half a billion people around the world. "Currently, we find 75 percent of the world's reefs are threatened by a combination of local and global threats," says Lauretta Burke, a senior author of the new report. "By 2030, the percentage will rise to 90 percent. By 2050, virtually all reefs will be threatened," she says. Many of the risks are familiar and long-standing. At a news conference Wednesday, Burke, of the World Resources Institute, talked about overfishing, and runoff of sewage and sediments from the shore. The report also folds in global threats. Greenhouse gases pouring into the atmosphere from our tailpipes and chimneys warm the oceans, causing heat stress to corals. Lots of that carbon dioxide also dissolves in the ocean, creating carbonic acid, which can eventually corrode coral and other shell-building animals. Add it all together, and one-third of all coral species are at risk of extinction, says Nancy Knowlton of the Smithsonian Institution's Marine Biology Research Institution. "These are dire projections," Burke says. But it doesn't have to be that way: "These results assume no improvement in management, no reduction in local threats, and that we continue on our current trajectory of greenhouse gas emissions." It will take a Herculean effort to reverse the current trajectory and leave healthy ocean ecosystems to our children and our grandchildren. Local threats are potentially easier to deal with, and there has been some progress in that regard. For example, President George W. Bush created vast marine protected areas in the Pacific to preserve reefs in U.S. territorial waters. "We obviously need more marine protected areas," Knowlton says. "Not just big ones like these, but small ones, local ones in the developing world, where major marine protected areas aren't financially possible, but small protected areas can do a lot of good."